Yes, Oprah Winfrey has endorsed the amazon Kindle. The screams of the women int he audience ripping open their foil-sealed devices was only second to those I've heard on her "Favorite Things" holiday show. One women even had tears in her eyes. Her Oprahness has announced this her new fave gadget, even life-changing. But with its retail price at a not-so-cheap $359, is it possible to get one for less? I trolled eBay (as I am wont to do), and found a range of from $107.50 for a kindle with a broken screen, to $369 with free overnight shipping. There are several around the $310 - $315 range, including one in "mint condition" that went for $321.08. OK, one of my latest fave products is the lil' "Tide to Go" stick. You know the one that had those funny commercials when it was introduced..with the soldier erasing his stain and yelling "Sir, what stain sir???" This does work like a charm on stains on clothing. I even got out old stains that were on a Santana knit white St. John skirt. It was good as new. Here's something you may not know about, tho...it works on rugs, too. Well, it would be hard to use on *big* stains on rugs, but I did get out a small coffee stain on our white carpeting in the bedroom. And we are talking dark coffee! OK, I'll admit I was sucked in by the mesmerizing animated ad...I think it was on AOL. It showed a woman with a wrinkled face, morphing through several less-wrinkled versions of her face, until she looked about 20 years younger. I thought about taking the bait until one day, a radio ad clinched the deal. (Hey, I'm human!). It featured a woman talking about how much younger her husband said she looked. I figured, how much could it hurt to try the thing? So I went ahead and ordered it one day, when, as usual, I had about five minutes to spare before heading out the door. The problem was, the lady on the other end of the phone seemed determined to not let me off in five minutes. She wanted to engage me in conversation, ask about wrinkles, etc. etc., and then explain the many benefits of the Hydroxatone product, how it "goes on like silk," etc., etc. (And more etecteras). I finally cut to the chase and said "I just want to order the product, please; I have to go somewhere," but after saying she would have me off very soon she proceeded to try to upsell me on some other subscription-based products. You know, the kind that keep coming unless you specifically ask to cancel them..and usually you don't get around to that until after you've spent more than you wanted. Well, I finally ordered the thing, after politely but exasperatedly declining the other stuff. Well, I must say it comes in nice packaging...a lovely round green glass jar. 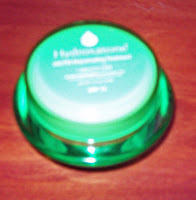 And it is a smooth cream that goes on "like silk" and blends nicely, similar to Oil of Olay, of which I am a fan. But I can't say that, for me, my face underwent that dramatic transformation that those animated ads depicted. It may have smoothed things out a little. I'm going to continue to use it until my supply is used up, but at this point, unless I see a big change in the third month, I don't plan to order a new stash. If you do buy it, I do recommend you take a "before" and "after" picture so you can compare them if you want. It's not all about shoes here at shopyack. We really like O Organics brand yogurt...esp the raspberry variety. It has a wonderful flavor and just the right consistency. Not too sweet, not too bland. I..I mean we...couldnt't find it at Safeway the other day. Please, say it isn't going the way of Fortified Oat Flakes, Big Buddy gum, Corn Bran, Choco-Lite, and all the other great foods that went bye-bye after I decided I really liked them. I finally had to say goodbye to the best flip-flops ever. I've worn them nearly every day of every summer since buying them about six years ago, and they've held up amazingly. But they finally snapped the other day, one of the straps pulling away from the top. They are super-soft and mold to your feet. I'm going to post a photo of the worn-out flip-flops soon. I couldn't find them aty any major online store, but you can buy them via their company's website, Island Slipper, at http://www.islandslipper.com. (They're not paying me to say this. I just really think they're great flip-flops). Coming soon...shopyack moves to blogger!